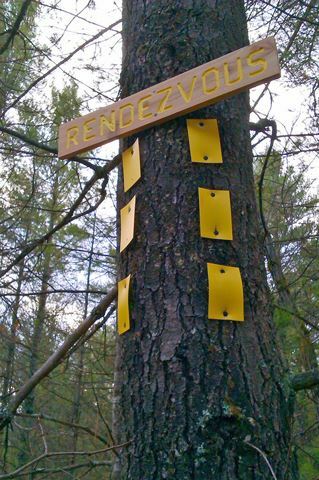 Yellow 3 x 5" trail markers have been placed along the trail system. Most junctions have named signs where trails intersect, however, these are not directional way-finding signs. Our "old way" of marking has two straight markers which would indicate you would need to turn either left or right, depending on where you see the next marker. Recently, we have been putting up two angled markers to show a turn plus direction. You will see both the straight and angled double markers on the trail system. A vertical marker is placed on the left-hand side of the trail. If a tree is not available on the left side, a marker can be placed on the right-hand side of the trail, and should be angled to let the trail user know to pass on the left-hand side. You may see another set of double markers on the side of the tree which indicates the direction of the trail when coming from the opposite direction. You may see another set of triple marker(s) on the side of the tree which indicates the direction of one of the other trails. Two or more trails may intersect.